Borderlinx | Buy TomTom and ship worldwide with Borderlinx. Cheap rates guaranteed. With more and more GPS navigation companies competing for customers, it can sometimes be hard to know which brand to trust. That's where TomTom USA comes in. For the past 20 years, TomTom USA has been honing its technology to provide users with the best GPS technology available. Offering GPS hardware and mounts for vehicle dashboards, the company also offers sports accessories such as wearable GPS tracking devices for runners. With devices pre-installed into some Fiat and Mazda vehicles already, TomTom USA Apps are also available for both iOS and Android so you'll never lose your way. TomTom USA strives to provide everyone with accurate maps and live GPS traffic information anywhere in the world. For individuals, in-car TomTom USA GPS devices start under $150, or users can utilize TomTom USA on their smartphones for under $50 with the TomTom app. Other accessories offered by the company include TomTom USA Runner GPS Watches, which enable athletes to track their runs. Special smartphone dashboard mounts are also available to make navigation safer and hands-free. TomTom USA also offers solutions for businesses such as tracking fleet vehicles, and providing driver feedback to reduce safety risks and wasted fuel. 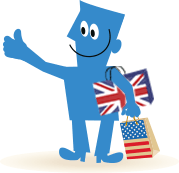 International customers can now buy TomTom in the USA with Borderlinx! Our Shipping cost calculator estimates cheap shipping, tax & duties upfront, and Borderlinx will then ship your order to your home. Borderlinx also offers a number of services such as concierge, free repacking, and consolidation services to make international ordering from TomTom USA hassle-free.